Add the cake mix and palm shortening to a bowl and use a fork to mix and create a coarse meal. Add the rest of the ingredients and mix until everything is combined. Add all the popsicle ingredients to a blender and puree until smooth. Use a knife or toothpick to mix the cake crumbles in to the batter some. Add the popsicle sticks and let freeze for 4-6 hours. When popsicles are frozen melt the coconut oil in a small saucepan and add the cocoa powder and maple syrup and whisk to combine. Let cool to room temperature. 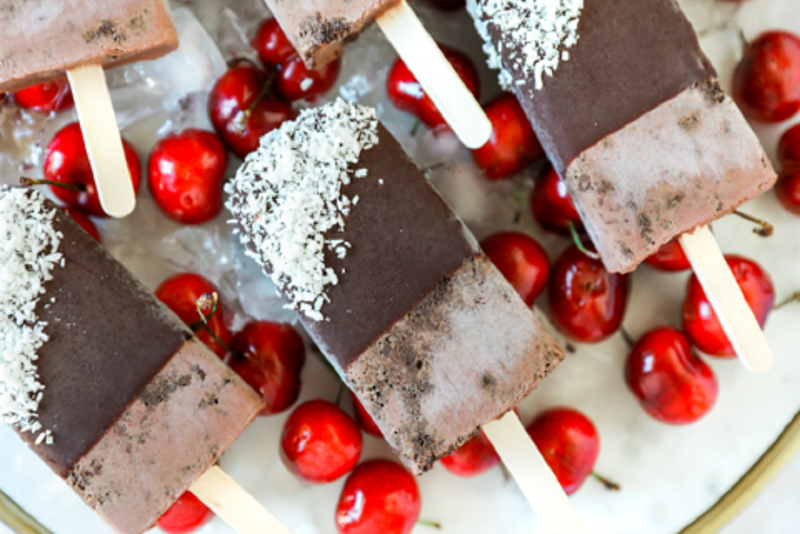 Pour the chocolate shell in a small cup and then dip the popsicle in the chocolate shell and then quickly top with the shredded coconut. Eat immediately or store in the freezer. Notes: Depending on the size of the popsicle mold you may have some additional popsicle batter or pie crust. I guess the 1/4 C of blank is cocoa powder?